— and what do you get? Well, one possible outcome would be this Omega De Ville. 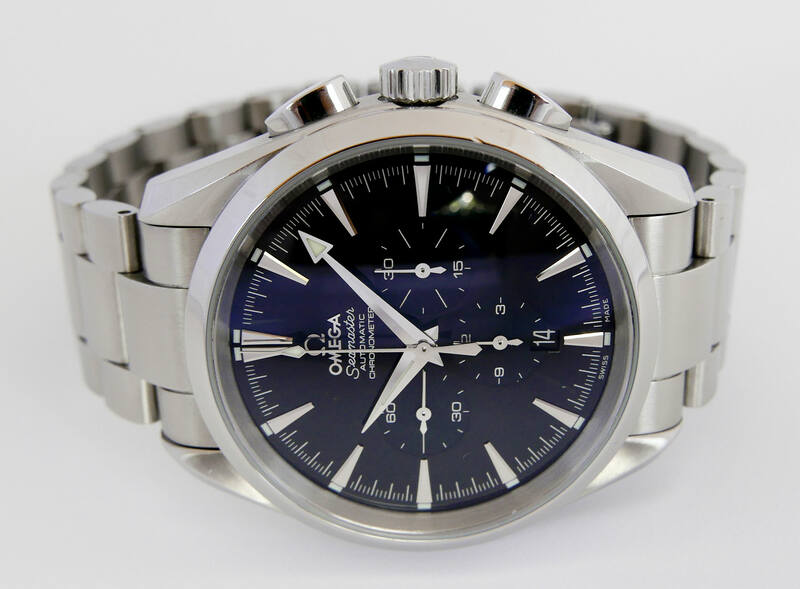 It has some of the form and all of the function of a Broad Arrow Speedmaster, but with the polished bezel look of the early Aqua Terra range. Given that it’s from 2005 that makes some sense. It has a different handset from its two relatives, along with some uniquely De Ville case lugs and *that* bracelet. 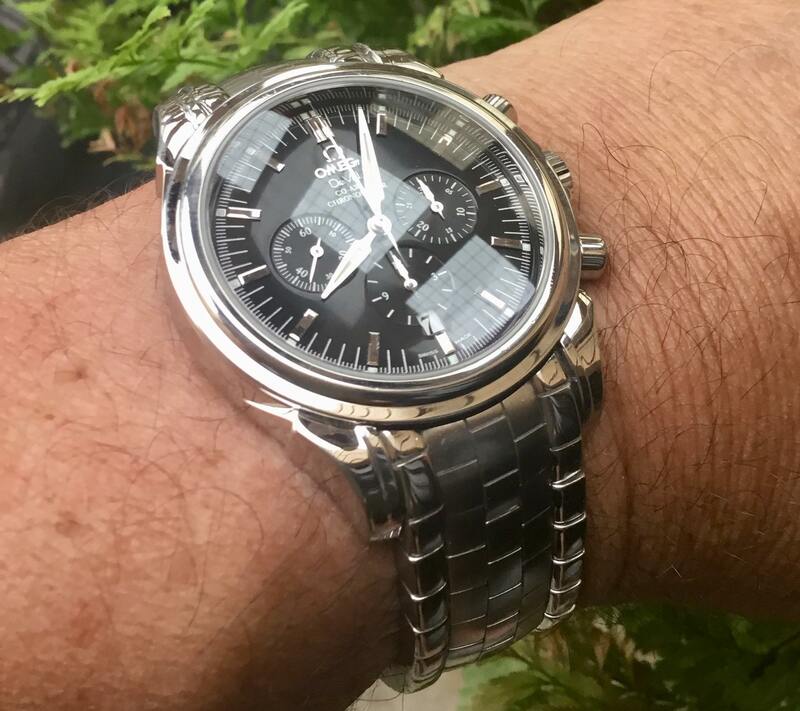 Having seen a non-chrono version of this watch in real life, I knew that (IMO) the bracelet is simply stunning. To me it’s a signature item along the lines of the Tag Heuer Link bracelet. It’s also an easy change to e.g. a leather strap, for a quick personality change. As I sold my standard black dial and chocolate dial Speedys as part of my purge in March, I felt there was an opening for something in that category. 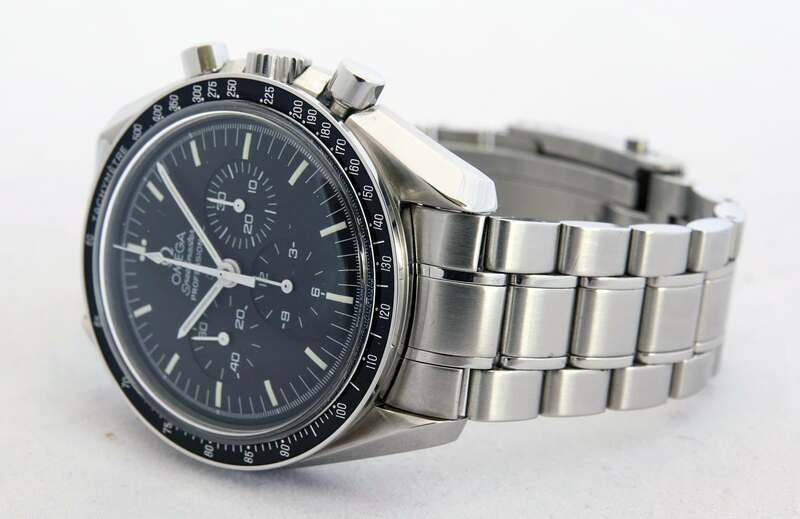 For me, I view this as a kind of dressy Speedmaster, in much the same way as I view my Zenith EP hand wound. 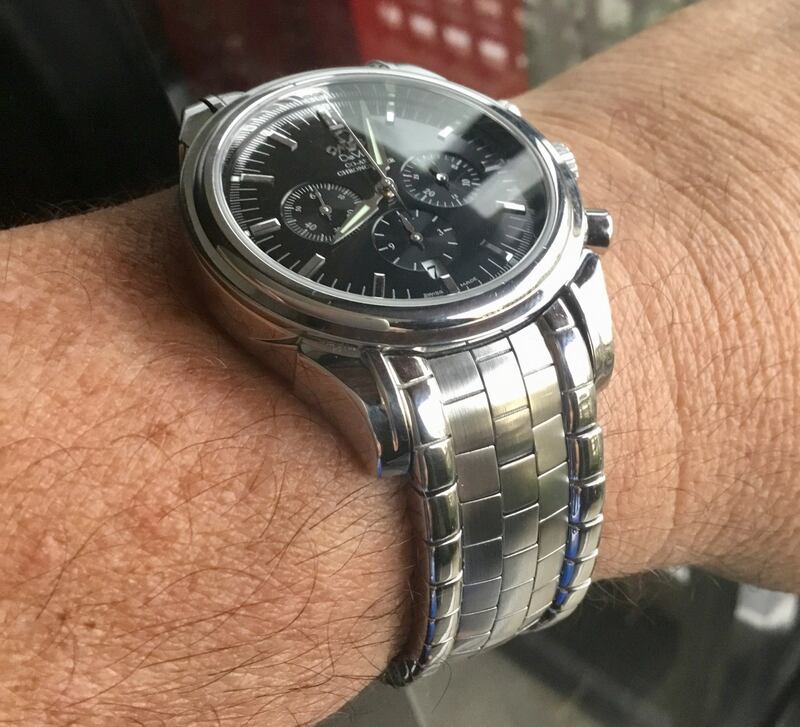 The difference between the two is that I love the Zenith on leather, but for me it just loses its attraction on its very blingy but also very ordinary bracelet. That’s unusual for me as I love a good bracelet - but the De Ville shines on the bracelet. I think (and hope) that the Zenith and the De Ville can happily live in the same collection for me. 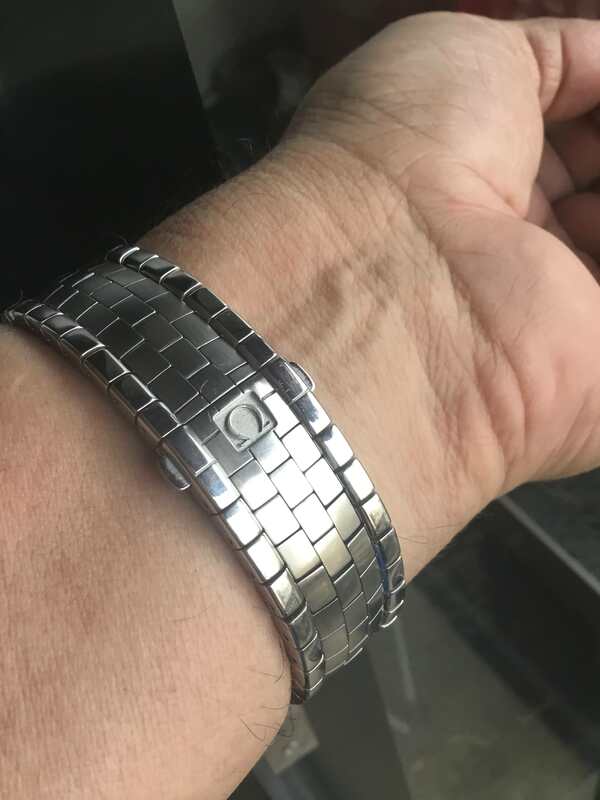 Speaking of the bracelet, the very, very short length of the links, means that it wraps around the wrist, almost snakelike. As a result, it’s superbly comfortable and looks very individual. In fact the closest look is the old fix-o-flex expanding bracelets, but without that hair pulling capability that they all seemed to have. 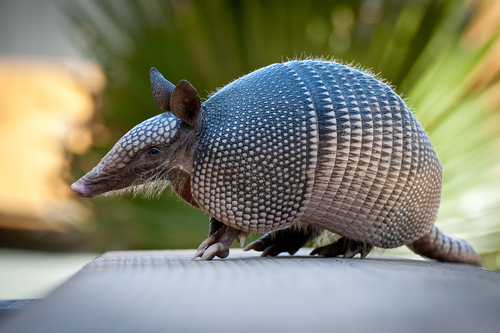 BTW the bracelet has its own nickname - the Armadillo. Very fitting IMO. The De Ville is powered by an automatic calibre 3313 chronometer chronograph movement. The early 33xx movements had a bit of a bad name, with some recurring issues across the range, but that’s largely a case of the squeaky wheel getting the oil. It seems a relatively few early problems, combined with a few people with an axe to grind have been re-quoted time and time again and have almost over-ridden the reality that the failure rate settled quickly to normality, but the mud has stuck to some extent. 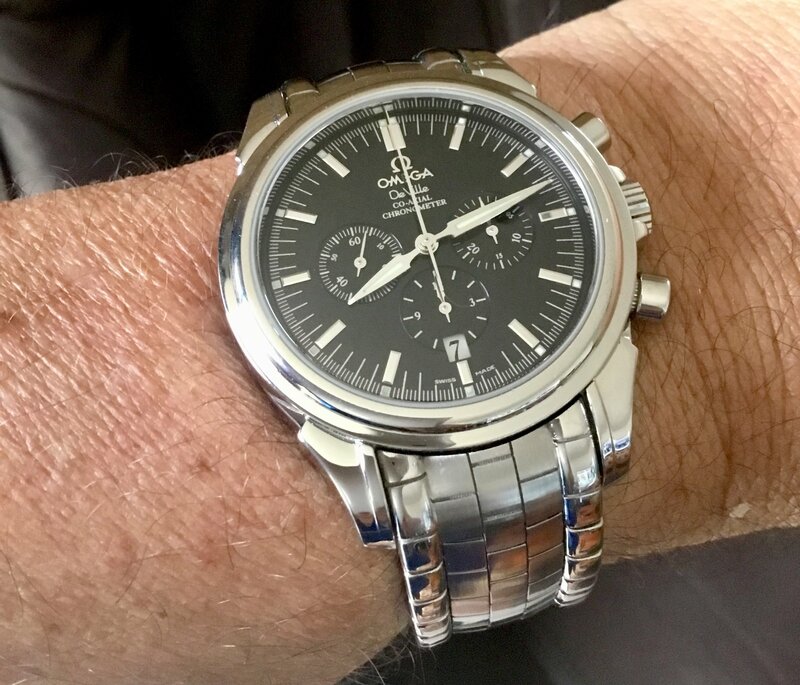 The other reality, is that any failures from 10+ years ago have been long since fixed (with part upgrades) and this watch had just been given a full service by an authorised Omega service centre in August. Part of the service on early models is to upgrade parts to B and C spec (if not already done), so it should be good for a while now. The movement itself is a column wheel movement with vertical coupling, a free sprung balance and (of course) a co-axial escapement. It’s a thinner and more sophisticated movement than the more commonly used calibre 1164 based on the ETA 7750. It’s broadly speaking, based on the F. Piguet 1185 (now Breguet), but with quite significant changes (some listed above) but also swapping two subdial registers to bring it into line with Omega’s layout preferences. My white & blue Broad Arrow has a 3313 in it, and the fact that an automatic chronograph could be fitted in the same case / case back as the 1861 hand wound movement is testament to how thin it is. 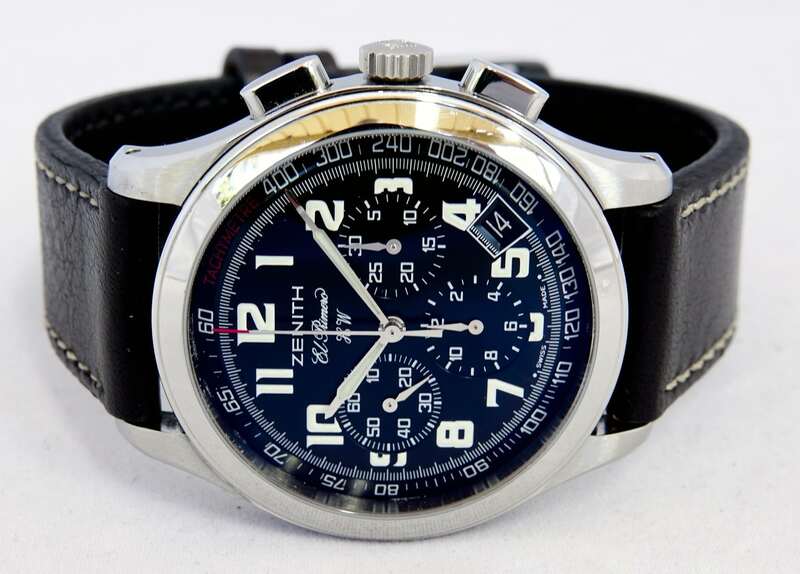 My (now sold) Aqua Terra chronograph was also a 3313. So this becomes 3313 number three. A bit to go before I catch up to the eight or so 861/1861s I’ve owned.... The case on this is elegantly slim as well. So it’s time for some photos. Very elegant Gary and I have never seen that style of Omega bracelet before. nbg wrote: Very elegant Gary and I have never seen that style of Omega bracelet before. I imagine it will be a marmite look, but I for one love it. The bracelet is a first for me too. Nice watch! I've seen a couple of these on Ebay in the past. I don't dislike the bracelet, but I don't think I'd wear it. You think they took the their design inspiration from a snake? Definitely has a reptile vibe going on. The watch itself however is very, very nice It's those Kit-Kat markers again, I can't get enough of them. 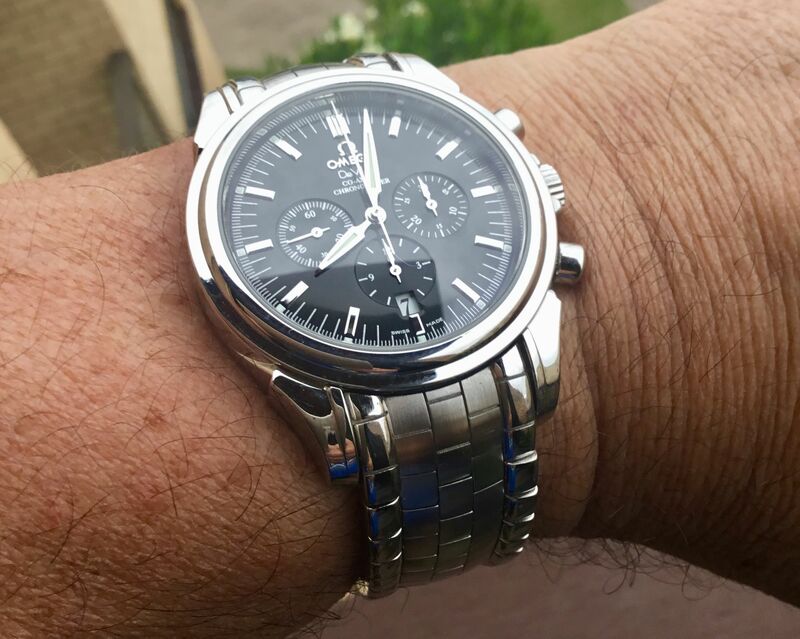 Another very readable chronograph from Omega, but with some blingy loveliness sprinkled in. I like it very much. The bracelet is a bit "marmite" or would that be "vegemite" (for Gary) but I like it and would certainly wear it. Thanks for showing us an unusual De Ville. 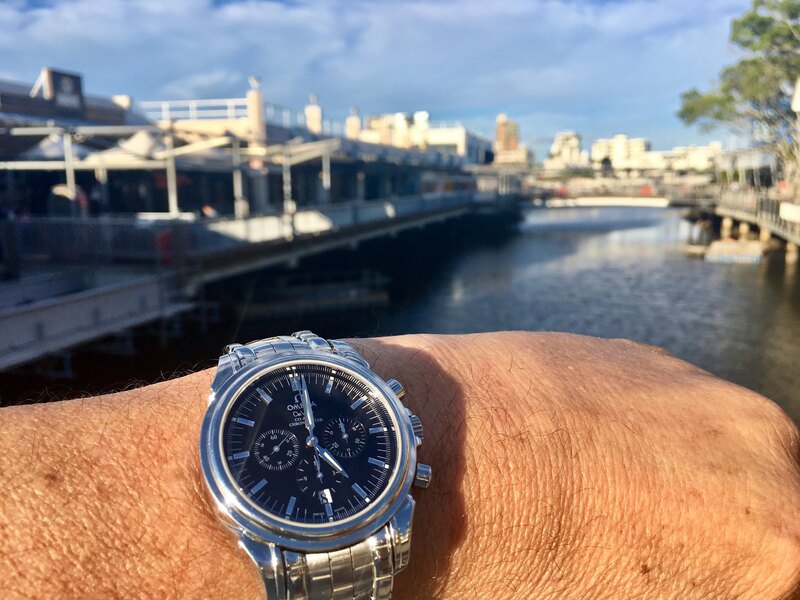 The watch itself is great, as you say, there are a lot of unheralded models lurking in the De Ville and Constellation ranges. But I'm not sure I could feel comfortable with the bracelet. I have seen it, tried it and it is actually great watch. Oh.. and brick bracelet is one of the comfiest things I have tried. Flexibility of jubilee without irritating wobble. Surely looks are not for everyone but without it watch looses it's uniqueness. 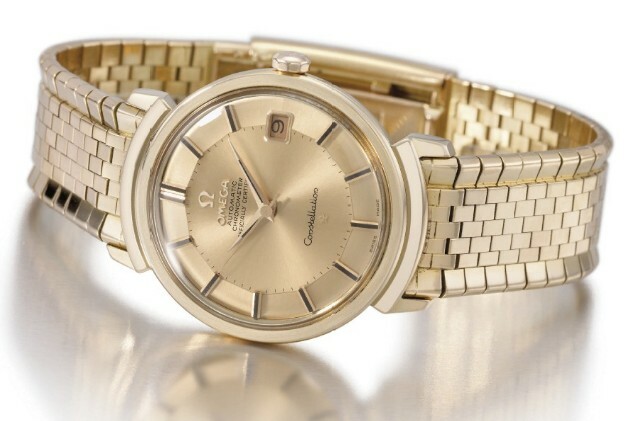 Large brands have "sleepers" in their offerings, like Rolex Prince and Omega Deville range. Great watch. 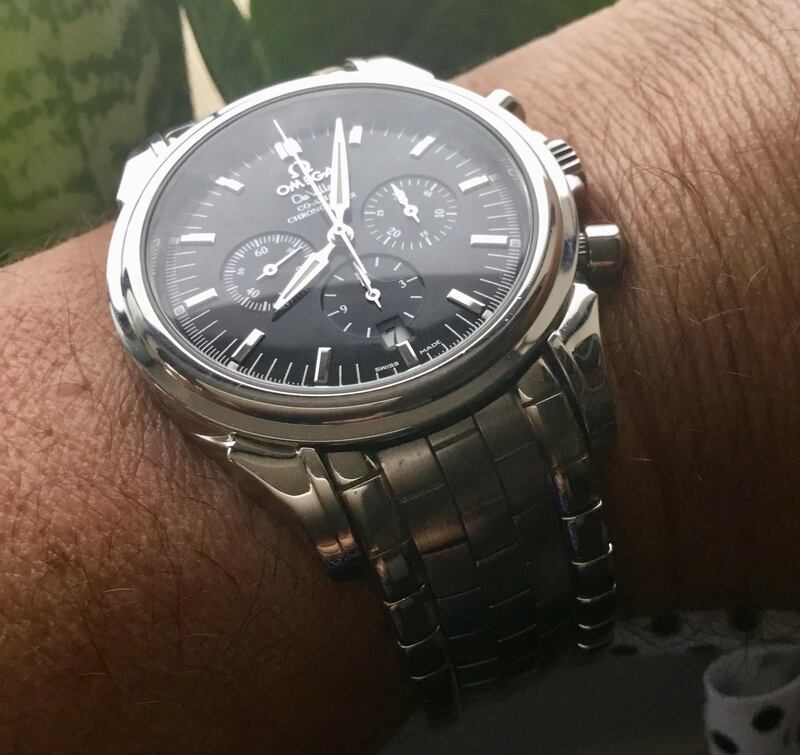 Much more Broad Arrow than Moonwatch, just without the Tachymeter bezel. I like it. The bracelet too, that's a work of art. Thanks also for all the historical details on it, much to learn. 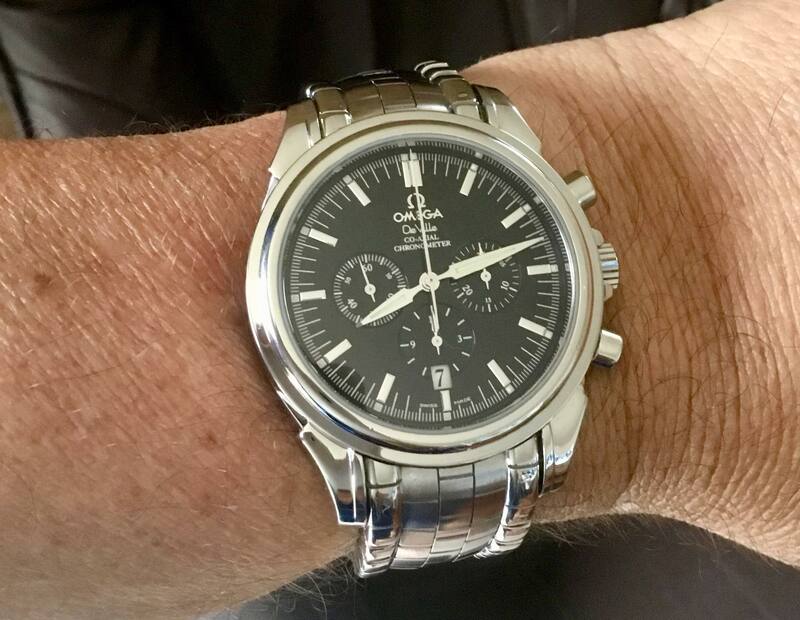 I've never known about that model or seen 1 before now even while doing extensive searches around the Speedmaster and Moonwatch variations. The more I view it and read others posts the more I see of the different design aspects. A worthy addition to your collection. Thanks for the comments everyone. 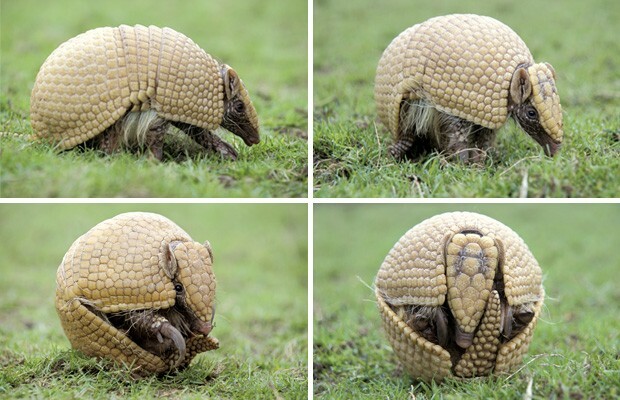 The bracelet seems to be known as an Armadillo for obvious reasons when you see them. 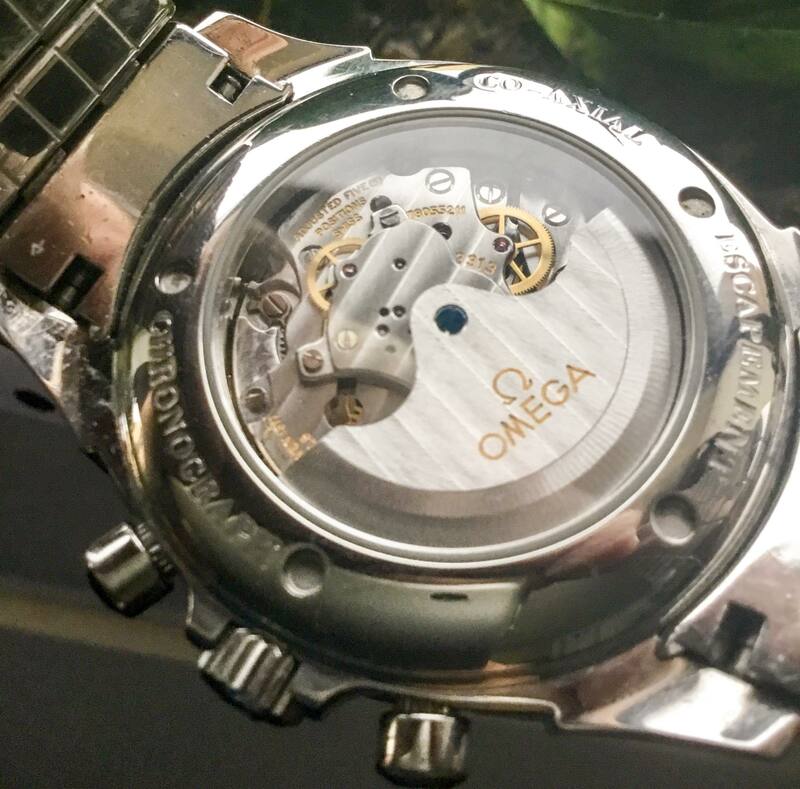 Also, the Armadillo bracelet was used previously by Omega on their yellow and rose gold Constellation range with the Grand Luxe models.